Oscar Schmidt 'Eagle' Concert Guitar Decalcomania ca 1930 |$775 | In the throes of the Great Depression, many guitar makers altered their manufacturing to weather the hard times, some more radically than others. The Oscar Schmidt Company, in Jersey City, NJ, introduced a line of guitars produced from less expensive materials, but gave them a glitzy look to attract buyers in these grim times. These instruments were cataloged as 'Decalcomania', and the guitars sported a range of decals, from minimal to way off the charts. This example is among the most decorated offered by the OS company. 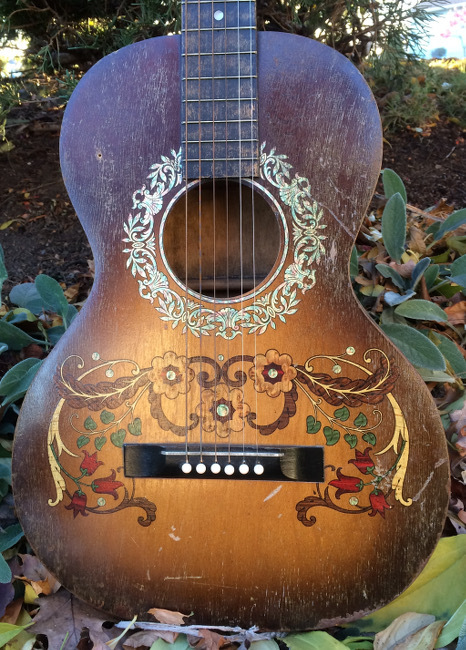 It sports a large decal which surrounds the bridge, and a gold decal surrounds the sound hole. The head stock is embossed 'Eagle' in gold script, with the same font as the 'Stella' stamp. This is the first we've seen an 'Eagle' branded OS guitar. 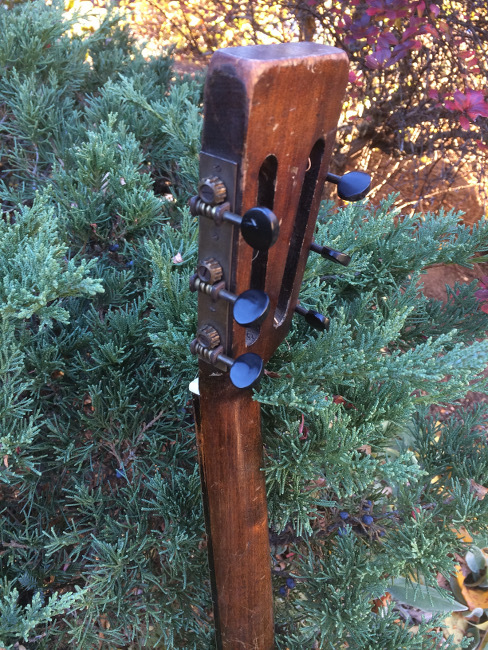 The guitar dates to around 1930, since it still has the 'gear-up' tuners, indicative of pre-1930 style tuners, and the head stock shape similar to pre-mid-thirties OS guitars. The body is solid birch, and the neck is poplar or basswood with a black painted fingerboard. The pin bridge is likely painted basswood. The tuners appear to be original. The guitar is a concert size, the smallest of the OS offerings. The lower bout measures 13 7/16" and the scale length is 24 7/8". The board measures 1 9/16" across at the nut, string spacing is 2 3/32" at the saddle, which is likely original to the guitar. Action is set at about 7/64". The body appears to have a small side crack in the bass bout waist, otherwise crack free and solid. The only prior repairs appear to be a neck reset, a small section of the back reglued to the side, and new bone nut. The frets are good. The finish is original, but looks to have been in a moist climate for a while, since the body finish has flaked quite a bit. The treble side is most affected (see photo). The guitar plays well and produces the birch-body bark that blues and old time music fans love. Check out the sound clip above. Comes with a soft case.